After four long years of being cancelled, Fox finally brought back ’24’ this week! Star Kiefer Sutherland plays Jack Bauer, a counter-terrorism agent and general badass. Jack has had to kill in the line of duty many times. 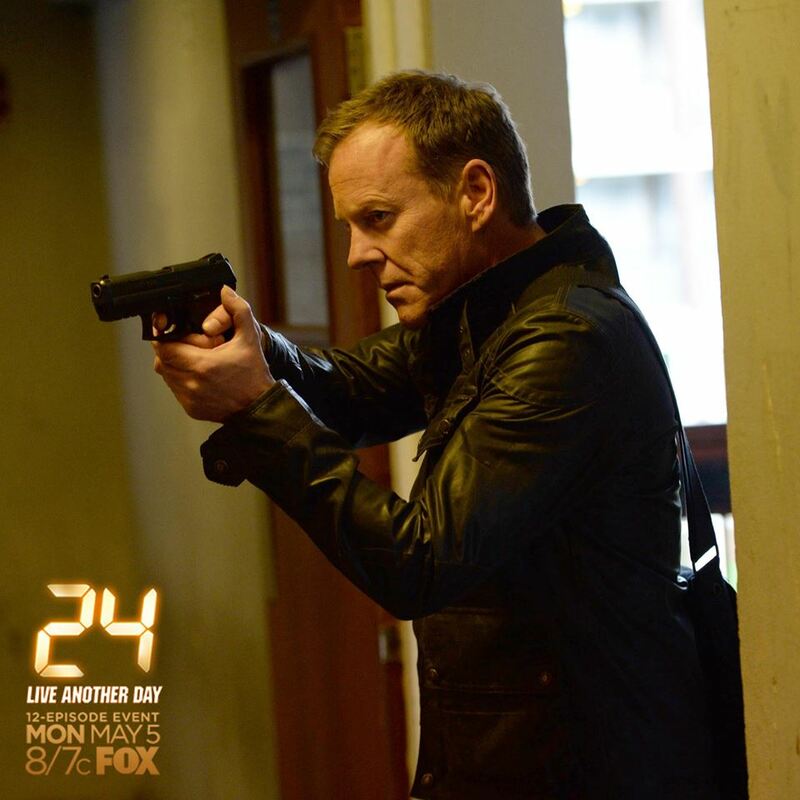 In fact, as of this past Monday’s premiere of “24: Live Another Day,” Jack Bauer has killed 273 people. How does this record stack up to a cause of death that so many people fear, death by shark bite? 1) The great white shark. Though the antagonist in “Jaws” is a great white, this species is responsible for only 78 human fatalities. 2) The tiger shark. These animals have a reputation for eating anything, but have killed only 28 humans. 3) Bull sharks have killed 26 people. 4) Blue sharks have killed four people. 5) Oceanic whitetip sharks have killed three people. 6) A dusky shark killed one person. 7) A grey reef shark killed one person. 8 ) A bronze whale shark killed one person. 9) A Galapagos shark killed one person. 10) A shortfin mako shark killed one person. Um… that’s it, not counting 2 fatalities attributed to lamniform sharks 7 fatalities attributed to the requiem shark family, as well as many cases where the species involved could not be identified. In the whole world, since 1580, there are only 153 human fatalities attributed to all species of sharks (when the species has been identified) combined. Jack Bauer has killed almost twice as many people as all sharks (when the species has been identified) in the last 450 years in the whole world. By the end of this season, I’d be shocked if he didn’t pass this mark. I promised you 24 species of sharks, so here are 14 more species, and a fun fact about each of them. 11) Greenland sharks eat polar bears sometimes. 12) Thresher sharks can whip their giant tails at more than 80 miles an hour. 13) The rarely seen megamouth shark was first discovered in 1976 when a navy vessel accidentally dropped an anchor on it. 14) Hammerhead sharks use their hammers to pin flat prey like stingrays to the bottom. 15) Angel sharks burrow under the sand and wait for prey to come to them. 16) A basking shark swam from Massachusetts to Brazil. 17) Cookiecutter sharks bite circular holes out of their prey, which includes one human (who did not die but has a nasty scar). 18) A female bonnethead shark in captivity gave birth without having mated with a male, a process called parthenogenesis. 19) Unlike many species of sharks, which need to constantly swim in order to breathe, nurse sharks (and some other species) can pump water over their gills. I saw a nurse shark hang out under the same coral ledge for about a week once. 20) Female lemon sharks return to the exact spot where they were born to give birth. 21) All members of the deep sea lanternshark family can glow in the dark, but E. spinax uses glow in the dark spines like “lightsabers”. 22) Sawsharks (which are not the same thing as sawfish) have a giant saw on their face. 23) Walking sharks can walk along the bottom using their fins. Update: As indicated by the title of the post, I am focusing on confirmed fatal shark bites (there is no doubt that the shark bite is what killed the human, there is no doubt what species was involved). The International Shark Attack File also has a list of 493 shark bites in the same time period if you include fatalities not attributed to specific species. Similarly, the list of Jack Bauer’s kills only focused on his confirmed on-screen kills, and as Jack Bauer was already a highly trained badass at the start of Season 1, we can assume that his list of unconfirmed off-screen kills is also quite high. For comparison’s sake, I focused on confirmed kills for both Jack Bauer and shark species. Western Australia's sharks need your help! Well, that’s a fine kettle of fish. I am a bit surprised that hammerheads haven’t killed anyone since they seem to be so prevalent and have such big schools. Thanks for the post. That list only contains confirmed attacks. It lists 3 people killed by oceanic white tips but the crew of the USS Indianapolis was in the water for over three days and there were some shark attacks. ~600 men died in those three days, most from other reasons, but we will never know how many were killed by sharks. I would venture that the list is probably wrong and an unknown number of men, probably not a huge number but some men were killed by white tips during those three days. Does that number include the reports of shark attacks on downed pilots and navy sailors during WWII, etc.? I’m no historian, but was it the USS Indianapolis? Is that story apocryphal? The ISAF is completely flawed. It gives it’s numbers on the basis of PROVEN IDENTITY for each shark species. For example, if anyone really believes bull sharks have only killed 26 people they are sorely mistaken. Likewise the oceanic whitetip has only been given 3 kills by the ISAF….yet the oceanic whitetip is the species most likely to have killed ship sinking and plane crash victims. The ISAF figures are completely flawed and sweked. Most shark attacks do not have a proven identified culprit, hence the low figure for each shark type. The vast majority of recorded shark attacks that have occurred since 1580 do not have any particular assigned shark species culprit fingered. You say “completely flawed,” I say “not making claims unless you have evidence”. As several of you have pointed out, yes, the ISAF data I used is only for cases when the species of shark has been identified. See also: title of this post.